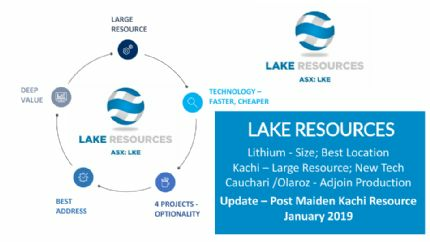 Brisbane, Nov 28, 2018 AEST (ABN Newswire) - Lake Resources NL ( ASX:LKE) provides the Company's latest Investor Presentation. 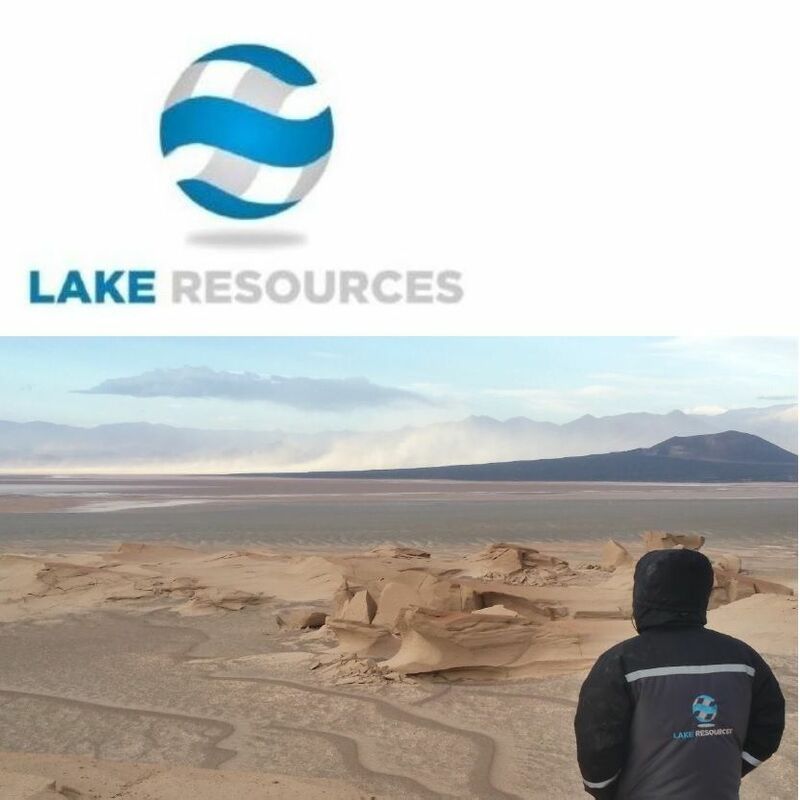 Lake Resources NL (ASX:LKE) is a lithium exploration and development company focused on developing its three lithium brine projects and hard rock project in Argentina, all owned 100%. The leases are in a prime location among the lithium sector's largest players within the Lithium Triangle, where half of the world's lithium is produced. Lake holds one of the largest lithium tenement packages in Argentina (~200,000Ha) secured in 2016 prior to a significant 'rush' by major companies. The large holdings provide the potential to provide consistent security of supply demanded by battery makers and electric vehicle manufacturers. The Kachi project covers 69,000 ha over a salt lake south of FMC's lithium operation and near Albemarle's Antofalla project in Catamarca Province. Drilling at Kachi has confirmed a large lithium brine bearing basin over 20km long, 15km wide and 400m to 800m deep. Drilling over Kachi (currently 16 drill holes, 3100m) has produced a maiden indicated and inferred resource of 4.4 Mt LCE (Indicated 1.0Mt and Inferred 3.4Mt) within a 8-17 Mt LCE exploration target (refer ASX announcement 27 November 2018). A direct extraction technique is being tested in partnership with Lilac Solutions, which has shown 80-90% recoveries and lithium brine concentrations in excess of 3000 mg/L lithium and is planned to be trialled on site in tandem with conventional methods as part of a PFS to follow the resource statement. Scope exists to unlock considerable value through partnerships and corporate deals in the near term. The Olaroz-Cauchari and Paso brine projects are located adjacent to major world class brine projects either in production or being developed in the highly prospective Jujuy Province. The Olaroz-Cauchari project is located in the same basin as Orocobre's Olaroz lithium production and adjoins Ganfeng Lithium/Lithium Americas Cauchari project, with high grade lithium (600 mg/L) with high flow rates drilled immediately across the lease boundary. Two drill rigs are currently drilling at Cauchari with results anticipated to extend the proven resources in adjoining properties into LKE's area with results anticipated from November into December 2018. This will be followed by drilling extensions to the Olaroz area in LKE's 100% owned Olaroz leases. 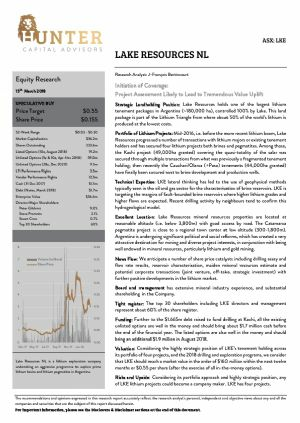 Significant corporate transactions continue in adjacent leases with development of Ganfeng Lithium/Lithium Americas Cauchari project with Ganfeng announcing a US$237 million for 37% of the Cauchari project previously held by SQM. Nearby projects of Lithium X were acquired via a takeover offer of C$265 million completed March 2018. The northern half of Galaxy's Sal de Vida resource was purchased for US$280 million by POSCO in June 2018. These transactions imply an acquisition cost of US$55-110 million per 1 million tonnes of lithium carbonate equivalent (LCE) in resources. 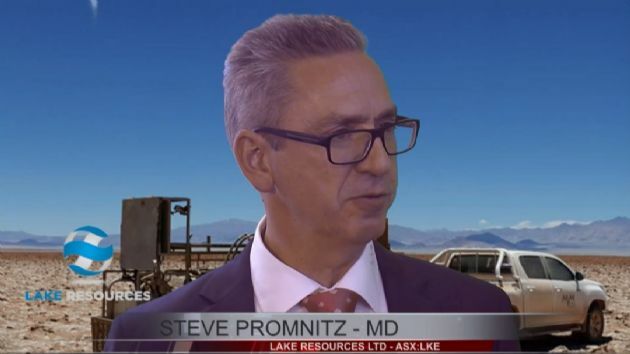 The demand for lithium continues to be strong for lithium ion batteries in electric vehicles, according to recent data from the leading independent battery minerals consultant, Benchmark Mineral Intelligence. Supply continues to be constrained suggesting good opportunities for upstream lithium companies.